- Stay organized. Jewelry repair orders with resealable, heavy-duty clear plastic bags keep jewelry and repair order together. - Make yourself clear. Professional appraisal forms present all your valuations in an easy-to-read format. - Get the details. Versatile jewelry register forms have plenty of room for special instructions like engraving or sizing. Compatible with portable registers. - Be prepared. 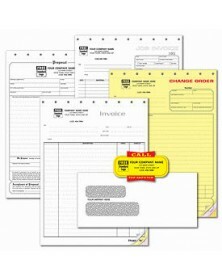 Durable portable registers give you a ready writing surface for 4 x 6" forms, wherever you and your customers are. Includes space to store file copies. - Promote your business. Attractive, affordable labels can be applied to most clean, dry surfaces. Glossy finish. Sold in pads. For indoor use only. Benefits and Features Every cleaning service needs proposal forms and work orders. This 300-piece kit has those and more, to help your janitorial business clean up. Save time and money with these proven and popular items. - Bring in more jobs. Cleaning proposal form has a checklist so everyone knows what to expect. Includes authorized signature line for customer. - Get the details. Cleaning work order has plenty of space to list sizes, materials, labor, carpet/upholstery, special instructions and more. - Make great impressions. Handsome, textured stationery can handle all your needs economically. 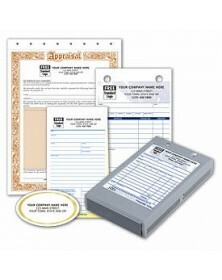 Great with your imprinted business information and logo. - Protect private information. Double window envelope clearly shows return and destination addresses and keeps confidential information from showing through. Benefits and Features Keep the essentials handy! 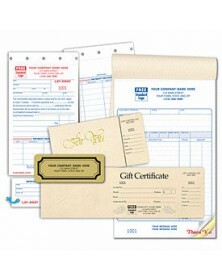 This 550-piece business forms starter kit has what you need to keep your retail business selling. Save time and money with these proven and popular items. - Make more sales. Large, classic design sales books can be used for receipts or invoices—at the counter, on the sales floor, or in the field. - Attract new customers. Ivory foil embossed gift certificates make great impressions. Certificate and detachable stub have matching consecutive numbers. - Sell today and tomorrow. Make the sale today and let customers finish paying later. Lay-away forms accurately detail terms and payments. - Promote your store. Advertise your business for less. Eye-catching foil paper labels are attractive and affordable. Sold in pads. For indoor use only. Benefits and Features It’s all here—estimates, work orders, invoices and envelopes! This 400-piece kit has all the essentials to help your landscaping business cover important ground quickly. Save time and money with these proven and popular items. - Win more business. Complete proposals help you anticipate every task. Authorized signature line shows customer acceptance of proposal and terms. - Get the details. Landscaping work order has plenty of space to list materials, labor, special instructions and more. Last part is durable tag stock. - Send accurate invoices. Includes the most common treatments preprinted to save you time writing up jobs, making it easy to bill on the spot. - Protect private information. Double window envelopes clearly show return and destination addresses and keep confidential information from showing through. Benefits and Features We worked all the bugs out! This 450-piece kit has all the essentials to keep your pest control business buzzing. Save time and money with these proven and popular items. - Meet expectations. 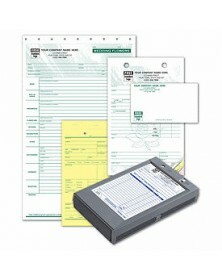 Service order forms include customer signature line to prevent disputes, and special fields to record EPA compliance information. - Make yourself clear. 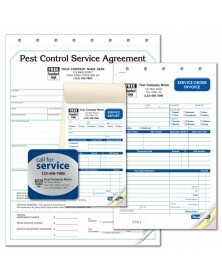 Pest control service agreements show service details, special instructions, prices, payment schedules and more. - Record the details. Service order forms have preprinted sections to list target pests, chemicals applied, application method and regulatory requirements. - Get repeat business. 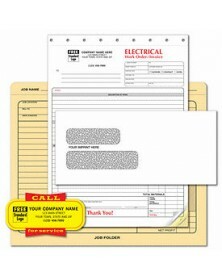 Fluorescent yellow "Call for Service" labels always let customers know how to reach you. Benefits and Features It’s all here—work orders, job folders and more! This 350-piece kit has all the essentials to help you generate sparks for your electrical contracting business. Save time and money with these proven and popular items. - Keep accurate records. Work orders with large lined sections leave plenty of room for capturing every last detail. Last part is sturdy manila tag. - Get repeat business. With fluorescent yellow "Call for Service" labels, customers will always know where to find your phone number. Benefits and Features It’s all here—everything from portable registers and forms to special florist envelopes! This 551-piece kit has all the essentials to help your floral business blossom and grow. Save time and money with these proven and popular items. - Get it in writing. 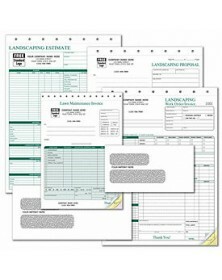 Florist order forms in 100-sheet pads can be used for sales orders, work plans, charge records, delivery slips, and more. - Record the details. Portable register forms, designed for florists, have plenty of room for recording sales, credits, special orders, returns and more. - Stay organized. Durable portable registers give you a ready writing surface for 5 1/2 × 8 1/2" forms, with space to store file copies. - Make great impressions. Wedding florist sales order forms help you plan successful wedding arrangements. - Promote your business. Envelopes made of 24# white stock hold standard 3 1/2 × 2 1/2" gift enclosure cards. Benefits and Features Keep the essentials handy! This 301-piece HVAC Business Forms Starter Kit has what you need to keep your HVAC business operating at peak efficiency. Save time and money with these proven and popular items. - Simplify. Combined HVAC service orders/invoices cover everything: work write-ups, invoicing and cost documentation. - Track jobs easily. 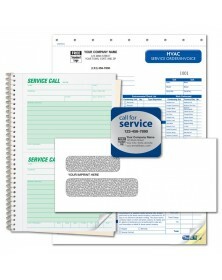 Record visits and generate new leads with pre-numbered service call books. Separate copies for sales force and office records. Kit comes with (100) #CON6540-3 Plumbing Work Order/Invoice; (100) #58167-1 Call for Service Labels; (3) #11-2 Service Call Books; (100) #771C Du-O-Vue Envelopes. - Keep accurate records. Work orders have preprinted checklists for choosing materials, scheduling jobs and recording materials used. - Track your jobs. 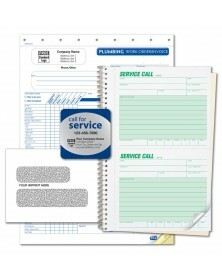 Pre-numbered service call books help you record visits and generate new leads. Separate copies for sales people and office records. Benefits and Features It’s all here! From proposal forms to change orders, this 425-piece kit has all the essentials to help you build and run your contracting business. 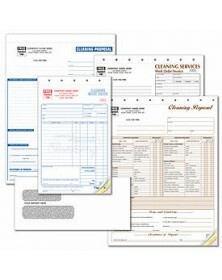 Save time and money with these proven and popular forms. - Get the details. Classic-format proposal forms provide space for all aspects of your project, including itemized costs, job specs and payment schedule. - Send accurate invoices. Itemize work completed, materials, labor, unit and total pricing, using up to 22 lines. - Simplify paperwork. Handle three tasks with one large format, carbonless form. Includes work order, cost record, and invoice. - Manage relationships. Carbonless change orders let you prevent work delays and misunderstandings. Includes authorized customer signature line. Why order each business form individually when you can get a package deal? To provide you with convenience, our business form kits stick to the essentials. Choose from general kits with a combination of the basics, including service or work orders, registers, invoices, packing slips, proposals, estimate forms, receipts, and purchase orders. Or, find just the right slips and books for your specific establishment. Either way, our business forms kits significantly shorten the ordering process without compromising quality and comprehensiveness.